Into the conquest of wild trails! In order to encourage the participation of some racers who would like to start with people from the same group and to encourage the inclusion of all, some waves are identified, but not reserved, to a group. This trail is designed for adults and teens 14 years and older. 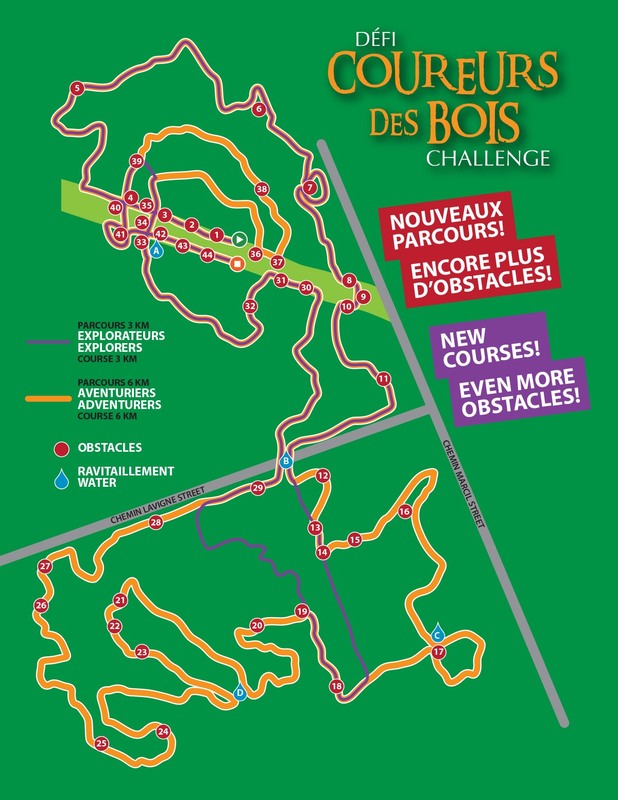 Participants will have to trek on a 6 km trail where they will encounter more than 35 obstacles. All will be challenged and will get to test their balance, strength, climbing ability, endurance and more. Adventurers start times will be in the morning, from 9:30 am, in waves of 75 participants, at 15 minutes interval. This start time is for competitive athletes. Elite start times will be at 9:00 and 9:15 am. Prizes will be given to the first three Elite runners (men and women) to have completed all obstacles. Spread out on more than 3 km, this trail is designed for ADULTS and CHILDREN 6 years and older. Filled with fun obstacles, it will challenge kids big and small! The Explorers Course start times are between 13:00 pm and 15:30, at 15 minutes interval. Parents registered to the Adventurers Course can run with their child registered to the Explorers Course, free of charge. Spread out on more than 3 km, this trail is designed for children with a competitive edge. Filled with fun obstacles, the participants will find challenging obstacles! Prizes will be given to the first three Young Elites runners (boys and girls) to have completed all obstacles. The Explorers Course Young Elites start time is at 12:45 pm and reserved for 10 – 13 years old. Here is some information to help you prepare for the Challenge. Please arrive one (1) hour before your departure time to allow yourself enough time to park, take the shuttle, complete the liability waiver form, register and warm up. No need to leave you personnal belongings in your vehicle. A supervised bag check will be available for our attendees at a cost of $2. You won’t have to take the shuttle to retreive your personal belongings. We also suggest you bring money to purchase a meal or snack, offered by La Binerie Plantagenet. Scouts will also be selling drinks and popcorn.